A 38-year-old man who got behind the wheel of an ambulance at the hospital was sentenced to a total of five months in custody last Wednesday at Craigavon Magistrates Court for motoring offences and receiving stolen goods. He was Arthur Donaldson, Parkmore, Craigavon who admitted all the offences. For taking a motor vehicle without consent, common assault and driving with excess alcohol he was given three months in prison while a concurrent term of two months was imposed for not having insurance. He was also banned from driving for two years for the traffic offences and fined £120 and banned for one year for not having a licence. Donaldson also admitted that between October 25, 2013, and September 11, 2014, he received stolen goods, namely a glass polisher and a buff polisher, knowing them to be stolen. For this offence he was sentenced to two months in custody to run consecutively making a total of five months in prison. The court heard that on September 10, 2014, police searched a house in Parkmore and found the two polishers in a shed. When interviewed he told police he had bought the items for £50 from a man who was driving a van around the area. A prosecutor said the items were worth over £1k. The owner claimed he had lost over £200 a month in earnings. 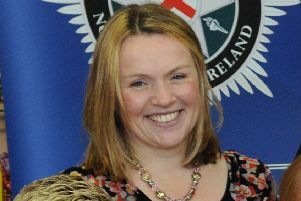 On February 23 this year police were called to Craigavon Hospital by ambulance staff after Donaldson, who had been a passenger, drove an ambulance about 20 to 25 metres at the hospital. One of the ambulance staff tried to stop the defendant, who was in an intoxicated state, but was pushed out of the vehicle. A blood test showed he was over the legal alcohol limit. Donaldson later said he remembered nothing. The barrister said that although Donaldson had a lengthy record there was very little on it for dishonesty. She explained that on the day in question Donaldson’s partner had found him sitting with a bottle of brandy. The partner was worried about his mental state and phoned for help. The defendant was taken to hospital by ambulance. The barrister said that what happened at the hospital had been a wake up call for Donaldson who now wants to get help with his mental issues. District Judge, Mr Mervyn Bates, said the defendant had a very bad driving record which included dangerous driving and driving while disqualified. He added there were also significant public order offences and Donaldson had been sentenced in the past to immediate custody. The judge said that the polishers were valuable items and there was a considerable loss to the owner. He added that it did not bear thinking about what would have happened if Donaldson had driven the ambulance for any further distance. Later in court Donaldson’s barrister applied for bail for him to appeal against the sentences. He was released pending appeal on his own bail of £500 with the conditions that he was not to be intoxicated in a public place and was not to attend Craigavon hospital except in the case of an emergency or a pre-arranged appointment.